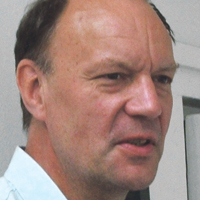 A thunderous, hypnotic drumbeat. The scalp-prickling drone of cellos. The low voices of a choir as they intone the lyrics of Space Oddity like monks at vespers. In the distance, the boom tish tish of a military band approaching. 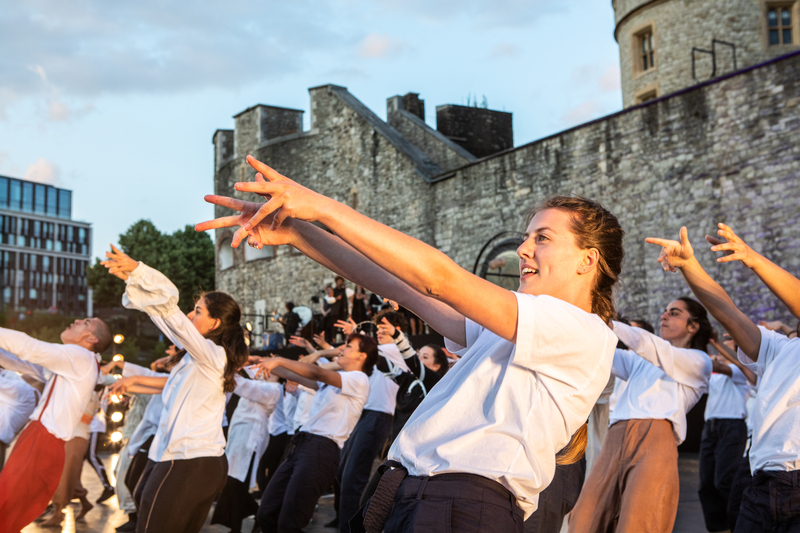 We are in the East Moat of the Tower of London witnessing one of the most extraordinary theatrical events I have seen in a long long while. As the band of the Irish Guards in full dress uniform – red tunics, huge black bearskins, leather boots shining in the sunlight – came wheeling around the corner to take up position between two raised platforms holding black-clad musicians and singers there is a palpable sense of two worlds colliding. The only question is: will it result in chaos or harmony? 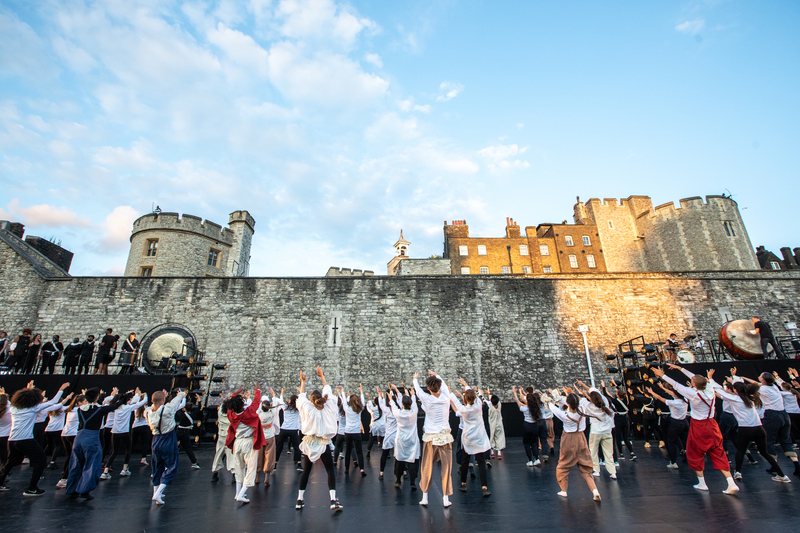 Four years in the making, this work is the result of a collaboration between East London Dance, Hofesh Shechter Company, Historic Royal Palaces and LIFT. In its way, it is as impressive as the field of ceramic poppies that once occupied the same location. 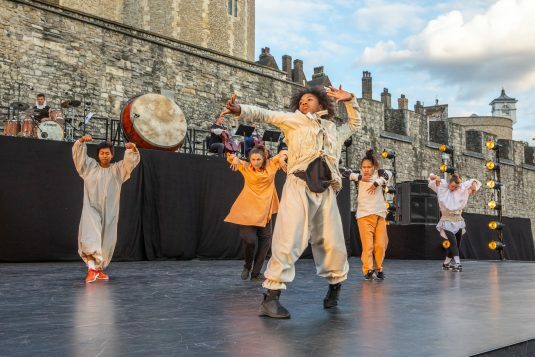 Six dance works from a variety of young choreographers are performed by over a hundred young artists and schoolchildren drawn largely though not exclusively from Tower Hamlets – where access to this kind of enterprise is more limited than most. 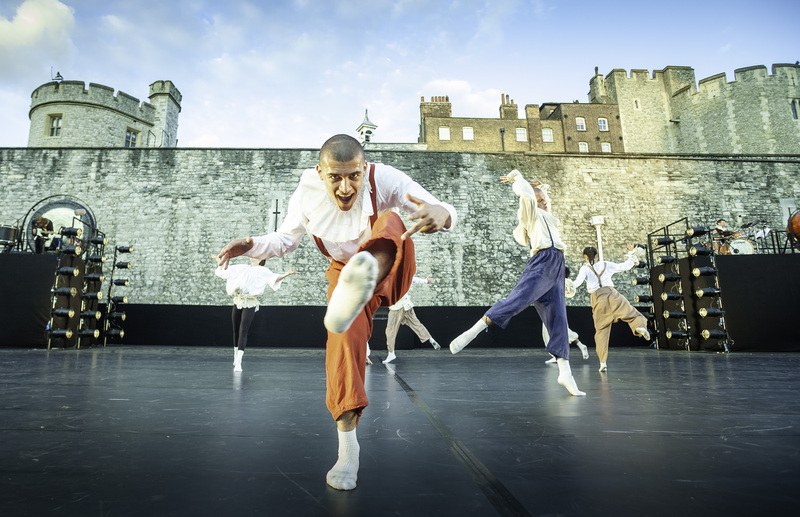 As successive teams of dancers pour through black curtains onto the stage beneath the two platforms the separate pieces blend into an organic whole without losing their individual character or style, from capoeira to krump, hip hop to Tae Kwon Do. 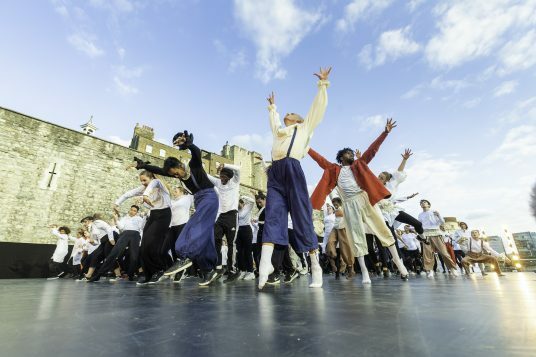 The opening piece by Joseph Toonga suggests workhouse kids in black and white uniforms kicking against more liberated street dwellers; James Finnemore’s work resonates with ritual – an isolated girl is given deferential treatment by the surging group around her; is she to be a bride or a sacrifice? The concluding pieta suggests the latter. An army of black clad mini ninjas come surging through the drapes in Duwane Taylor’s dynamic work, performing a ferocious military-grade drill like warriors in the making. Becky Namgauds damps down the aggression with her troupe rolling across the stage like a slow-flowing river before separating into couples in a pastiche of courtly dance. The concluding pieces by Hofesh Shechter are unmistakable. 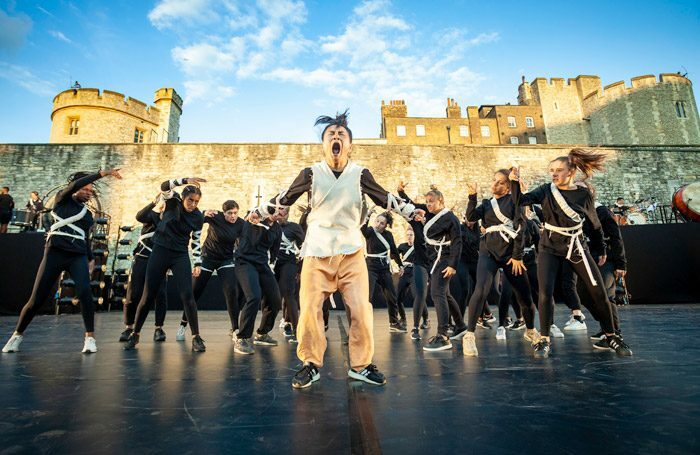 The stage erupts in a simulation of gang warfare; punches are thrown, throats slit, bodies thrown backwards by bullets in an obscene ecstasy of violence. The fluttering, loose-wristed hands and little hopping steps, the saurian crouch and sudden upward stretches are accompanied by the droning howl of souls in torment and a snare drum hissing like a nest of rattlesnakes. The return of the Irish Guards may signify some kind of restoration of order but it does nothing to quell the unfettered spirit of the performers, all of whom arrive on stage for the finale – a tsunami of joy and a tribute to the collective spirit embodied by this endeavour. London is the crucible for this kind of artistic alchemy and it belongs to all of us.